Здесь представлена один из разделов пятой главы каталога, сопровождавшего выставку работ художника эпохи Возрождения Фра Анжелико (15 век) в Музее искусств Метрополитен в Нью-Йорке в 2005 году. Каталог составлен кураторами этой выставки Лоуренсом Кантером и Пиа Палладино. Бумага и золото на дереве. Although Longhi's attribution has been unanimously accepted by scholars, both the dating and the unusual iconography of this work — considered one of Angelico's most intensely devout creations — have been the source of debate. 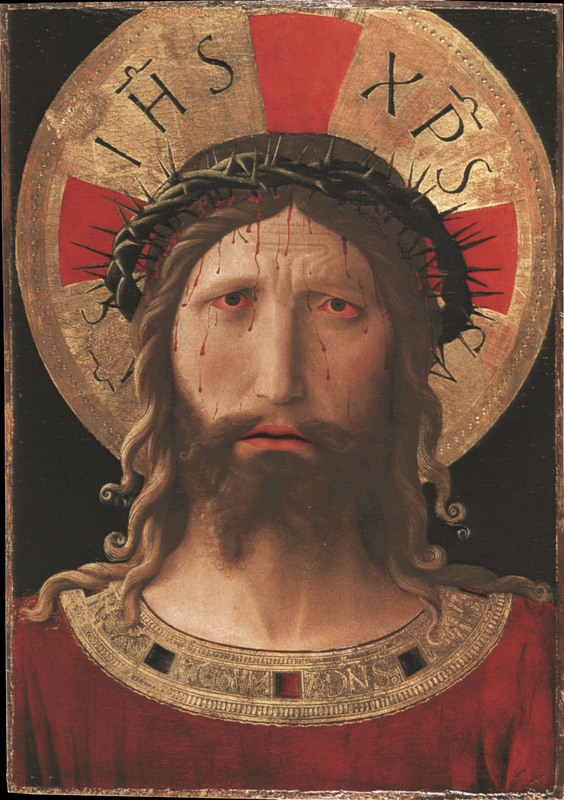 Longhi, who dated it between 1430 and 1435, in close proximity to the Linaiuoli tabernacle, viewed it as Angelico's entirely original invention of a new prototype, in which the image of the suffering Christ crowned with thorns, derived from larger compositions, was adapted to the rectangular, portrait-like format of paintings of the Holy Face (Sancta Fades), which had been widely circulated in Europe, especially in the Northern countries, since the early fourteenth century. (*3) The unique character of the Livorno Christ was also emphasized by Liana Castelfranchi Vegas,(*4) who dated the panel to about 1438, and considered it the model for other nearly contemporary Netherlandish versions of the subject, such as the image on the reverse of Rogier van der Weyden's Portrait of a Woman in the National Gallery, London, and Petrus Christus's Head of Christ of about 1445, in The Metropolitan Museum of Art. 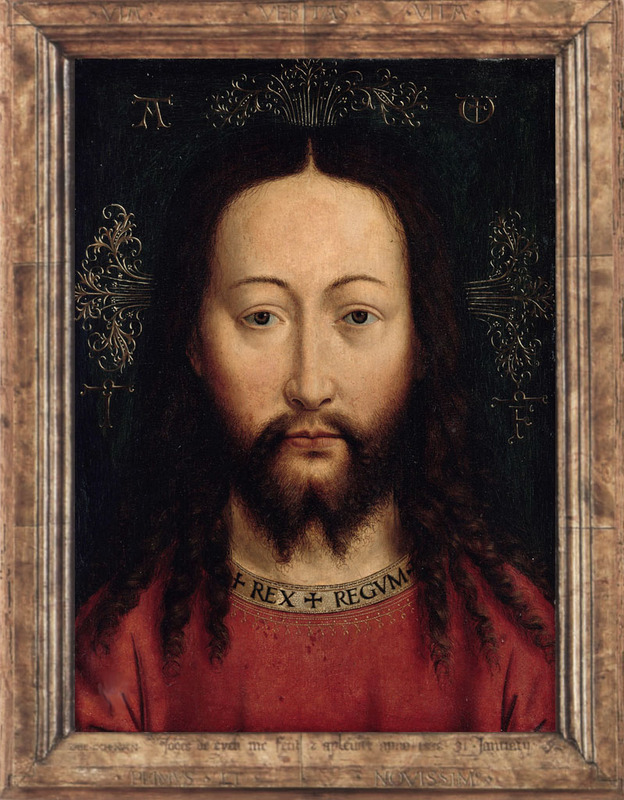 As suggested by the above arguments, a point of departure for any discussion of the Livorno Christ is provided by its unusual iconography and its presumed relationship to Netherlandish models, beginning with the vividly realistic image of Christ as Rex Regum (King of Kings) formulated by Jan van Eyck. In this work, now known only through copies, the earliest of which, in Berlin (fig. 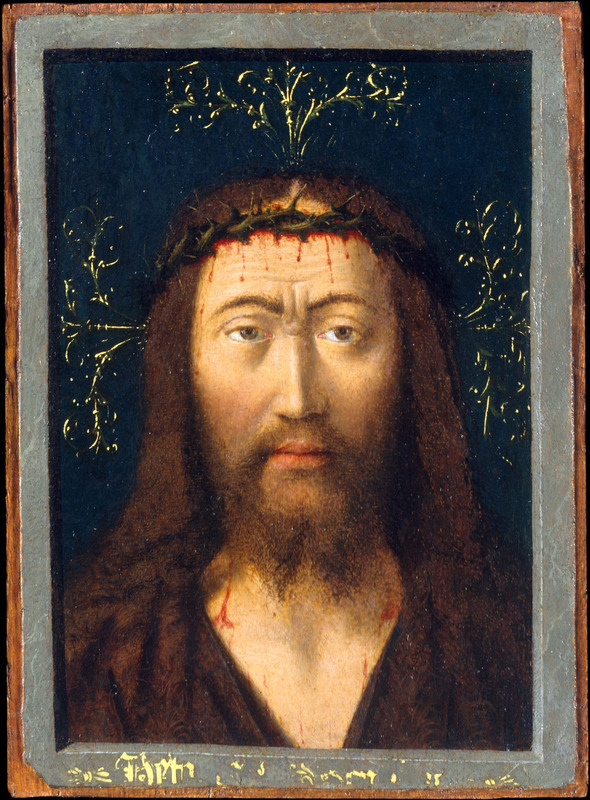 96), is dated 1438, van Eyck transformed the iconic, two-dimensional type of Holy Face paintings into a life-like portrait of Christ "as a living being," situated behind a trompe-l'oeil frame that further heightens the illusionistic quality of the image. (*8) Wearing a regal red robe inscribed with the words "REX REGVM," his face uniformly bathed in light, van Eyck's Christ became the most immediate, "true likeness" of the Redeemer in all his triumphant glory. The original destination of the Livorno Christ, as well as its specific function, are unknown. Saint Antoninus's text, cited above, might suggest that the image was intended to fulfill the same function as a Crucifix, as an object for private meditation on the Passion of Christ. Placed on an altar, it could have served a purpose similar to that of more traditional Veronica paintings, whose role in the daily devotions of cloistered women, in particular, recently has been discussed by scholars. (*19) On the other hand, the confirmation of an early date for the painting's execution leads to a reconsideration of the compelling hypothesis, put forward nearly thirty years ago by Giulia Brunetti (but ignored in the subsequent literature), that this might be the "volto sancto" listed in an old inventory of the furnishings of the Altar of the Annunziata in the Servite church of Santissima Annunziata in Florence. (*20) Compiled between 1439 and 1441 — that is, before the altar underwent the radical transformations carried out by Michelozzo on behalf of Piero de' Medici — the inventory refers to "uno volto sancto dipinto sta in su it ditto altare bello e divoto" ("a holy face which is on the said altar, beautiful and pious"). 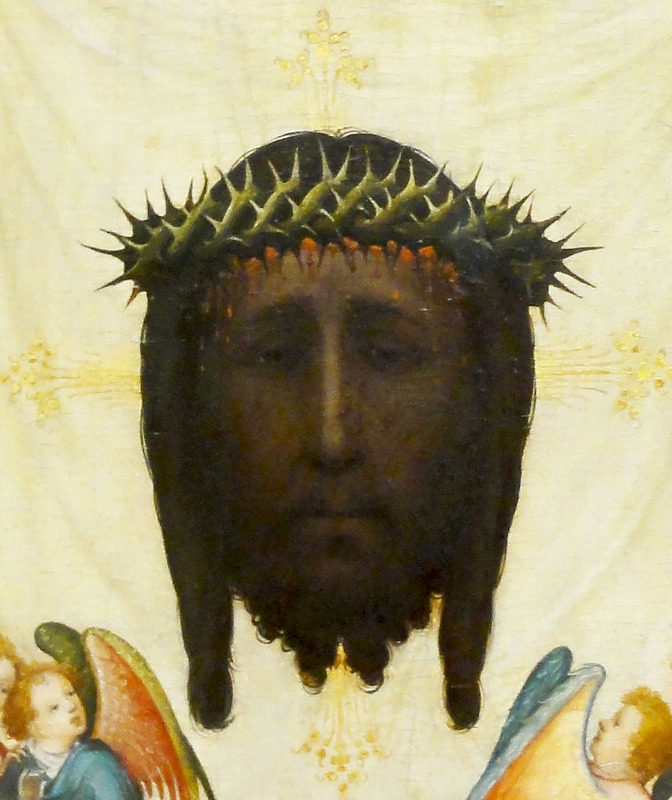 According to Brunetti, despite the apparent discrepancy in subject matter, this reference could apply to the Livorno painting, which is identified in an inscription on the reverse as a "Holy Face of Jesus Christ." Significantly, in the sixteenth century, the Altar of the Annunziata contained another painting of the Holy Face, by Andrea del Sarto, which was described by Vasari in the following terms: "Shortly after . . . Andrea del Sarto painted a Head of Christ, which is now preserved by the Servite monks on the altar of the Annunciation; and this is so beautiful, that for my part I do not know whether the human imagination could possibly conceive any more admirable representation of the head of the Redeemer. "(*21) In the seventeeth century this image was inserted into an elaborate tabernacle commissioned by the Medici. (*22) According to nineteenth-century sources the new tabernacle had been built so that Andrea's painting would be movable, and could serve as a temporary replacement for the silver door with the monogram of Christ that was removed when the Host was not inside. 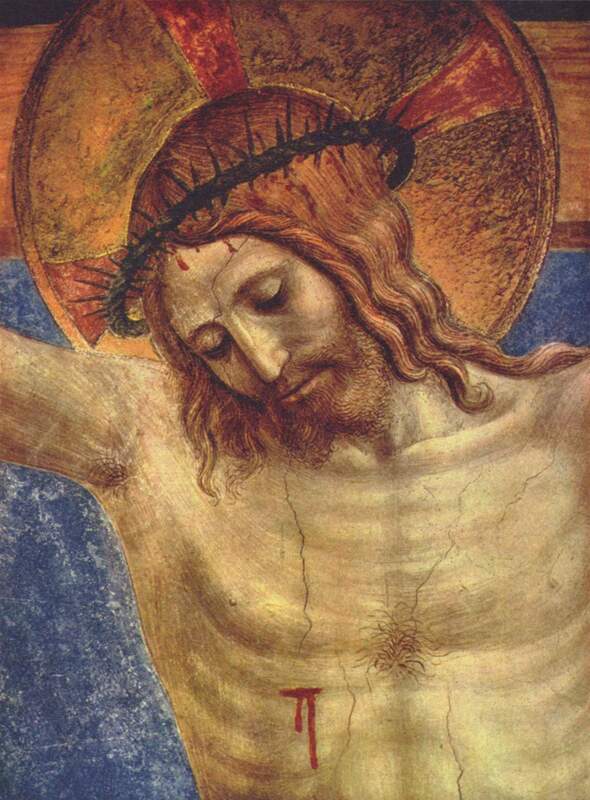 On this basis, it has been suggested that Andrea's painting may, in fact, have been designed originally as a tabernacle door rather than as an independent devotional object;(*23) whether or not Fra Angelico's Christ Crowned with Thorns is, indeed, the painting mentioned in the 1439-41 inventory of the same altar, it is worth speculating whether it might have served a similar function. 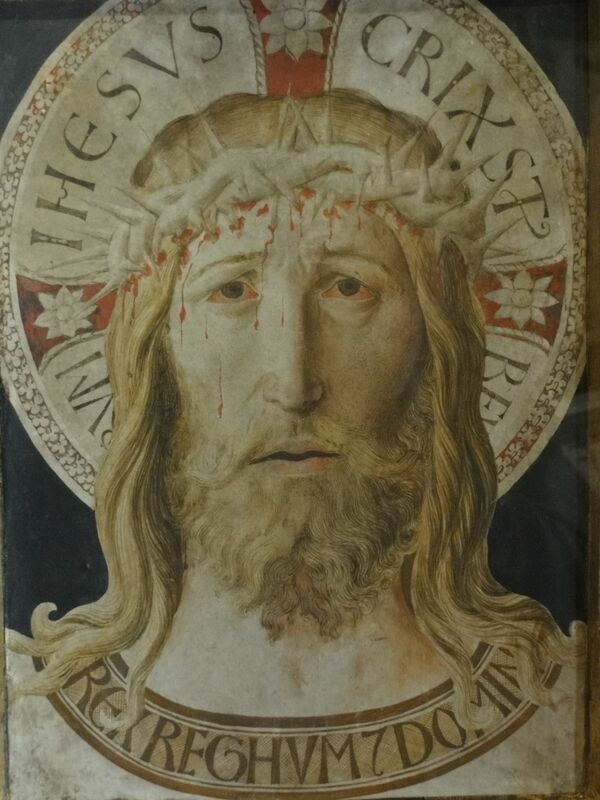 That the Livorno Christ was produced for a patron of some note, or that it was on public display on the altar of as important a Florentine church as that of Santissima Annunziata, is perhaps confirmed by the existence of the copy in Assisi attributed to Benozzo Gozzoli. Сокровищница Базилики Святого Франциска. Ассиси, Италия. (*1). Longhi 1928a, pp. 153-59 (ill. in Longhi 1928a [1968 ed. ], pp. 37-45). (*2). L. Berti, in Florence 1955, p. 34, no. 19. (*3). For a discussion of the evolution of this image, see G. Wolf, in Kessler and Wolf 1998, pp. 153-79. (*4). Castelfranchi Vegas 1983, p. 70. (*5). Baldini 1970, p. 96, no. 45 (dated 1435); Pope-Hennessy 1974, p. 227 (about 1436); Boskovits 1994, pp. 386-87 n. 25. (*6). A. De Marchi, in Bellosi 1990a, pp. 104-5. (*7). Spike 1996, p. 238, no. 83; Bonsanti 1998, pp. 154-55, no. 82; B. Fricke, in Morello and Wolf 2000, pp. 188-89; Nuttall 2004, p. 235. (*8). See Ainsworth 1994, p. 86; and, most recently, Wolf 2000, pp. 111-12; K. Gludovatz, in Morello and Wolf 2000, pp. 187-88. (*9). Nuttall 2004, p. 235. In support of Eugenius IV's taste for Netherlandish painting, Nuttall (ibid., p. 32) mentions a letter written from Rome by Cardinal Jean Jouffroy, Bishop of Arras, in 1468, in which the prelate refers to the genius of "John of Bruges, whose paintings you have seen in Pope Eugenius' palace." As noted by Nuttall, the Medici inventory (Spallanzani and Gaeta Bertela 1992, p. 72) refers to a painting in Giuliano's room: "uno colmetto picholo, cornicie messe d'oro, dipintovi una testa d'uno Cristo, opera fiandrescha" ("a small panel with a gilt frame in which is painted the head of Christ, Netherlandish work"). (*10). 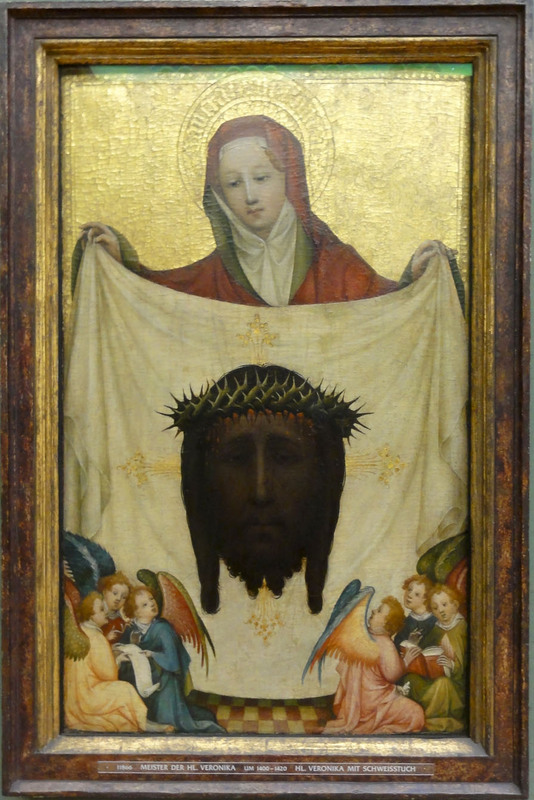 This version of the Veronica type, with the suffering Christ, appears to have made its first appearance about 1400 in the work of the Netherlandish painter known as the Master of the Veronica; see Wolf 2000, pp. 111-12. Citing the portrait in the National Gallery, London, Panofsky (1956, p. 112) credited the invention of this particular conflation of images to the workshop of Rogier van der Weyden. The National Gallery panel, however, like the Petrus Christus painting in the Metropolitan Museum, shows Christ dressed in a gown, rather than the regal red robe. Angelico's image (not cited by Panofsky) appears to be the one most closely indebted to the Rex Regum portraits. (*11). "And he hath on his garment, and on his thigh written: King of Kings, and Lord of Lords"; B. Fricke, in Morello and Wolf, 2000, p. 189. (*12). P. Scarpellini, in Ciardi Dupre Dal Poggetto 1980, p. 56. (*13). Revelations, Book VII, as cited in Butkovich 1969, p. 62. (*14). Boskovits 1994, p. 386; see also L. Kanter and P. Palladino, in Morello and Kanter 1999, p. 110 (reprinted in Morello and Wolf 2000, pp. 189-90). (*15). "Conforto anco la carita vostra che ogni di pigliate una poca di meditazione della passione del nostro Signore Gesu Cristo [...] inginocchiatevi dinanzi ad uno Crocifisso e cogli occhi della mente, piu che con quelli del corpo, considerate la facia sua. Prima, alla corona delle spine, fittegliele in testa, insino al celabro; poi gli occhi pieni di lacrime e di sanque; la bocca, plena di fiele e di bava e di sangue; la barba, similmente piena di bava e di sangue e di fiele [...] E a reverenzia di tutte queste cose direte un patemostro con avemaria" (Sant'Antonino, Opera a ben vivere ..., part III, chap. XI, p. 149 [as cited in Boskovits 1994, p. 138]). (*16). K. Christiansen, in Ainsworth and Christiansen 1998, p. 49. (*17). Boskovits 1994, p. 386. (*18). For the correct interpretation of the date of this work, see Bonsanti 1998, pp. 141-42. (*19). Hamburger 1998, pp. 229-46. (*20). Brunetti 1977, pp. 228-35. (*21). Vasari 1911 ed., vol. III, p. 261. (*22). For this painting and the tabernacle, still in Santissima Annunziata, see C. Caneva, in Florence 1986, pp. 103-4, no. IX; D. Liscia Bemporad and E. Nardinocchi, in Casalini et al. 1987, pp. 302,331-34. (*23). C. Caneva, in Florence 1986, pp. 103-4, no. IX. (*24). For these images, attributed to a so-called Master of the Pieta di San Costanzo, see Todini 1989, vol. I, p. 165.